It was not without considerable trepidation that I started work on my first “Alice” production at the Civic Repertory Theatre. I realized that the word “faithful” must be the keynote of any such venture if it were to find favor with an audience. The love that countless people feel for the “Alice” books amounts to fanaticism, and I felt a deep and solemn responsibility to Carroll and the public. Carroll is not one of those writers for children who become “as children” themselves. He presents the problem as seen by a child, but comments upon it as an adult mathematician on a holiday. Hence the bewildering and fascinating texture of his story; half adventure, half chop-logic and shrewd caricature. It seems to me that a stage presentation of “Alice,” in order to be faithful to the books, must appeal equally—though for different reasons—both to children and adults. 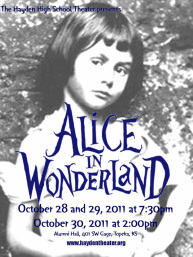 Through the use of various devices of modern stagecraft the action is continuous, Alice never leaving the stage. I felt it important to devise a technical scheme whereby all the places and characters of Alice’s dream come to her—that since we experience these through her mind, she must never disappear from our sight.